We are so excited that Fall is here! The weather starts getting a little colder and we start wanting to make things. So, we are here to help you get your creative nature flowing. Our classes are listed on the website also. If you would like to sign up for a class, you can do so by either calling the store or put all of the classes you want to attend into your "cart" and we will get you on the list. Oct. 16 @ 6:00 pm- All Nighter: Work on anything that you have in your stash or come get something new. 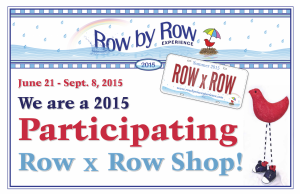 A great time to get together with other women and enjoy sewing and friends. Sew as long as you want! We will stay until you decide to leave. 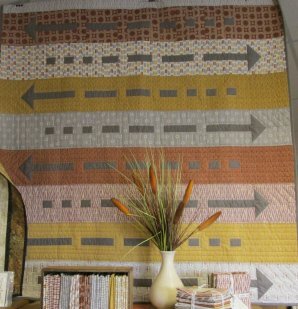 Oct. 24 @ 9:00 am- Wanderlust Arrow Quilt: Snuggle in and dream about all of the adventures you'll have in faraway places. 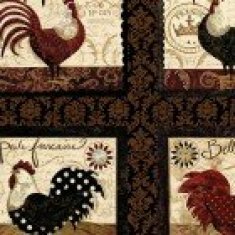 Oct. 27 @ 6:00 pm- Easy Binding: Complete a potholder and learn to make perfect mitered corners on your binding. (Walking foot required) All supplies included. 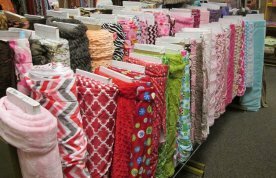 Oct. 29 @ 6:00 pm- Minkee Madness: You choose your project and go home with a finished..... Row by Row quilt, pillowcase, receiving blanket or a pillowbed. 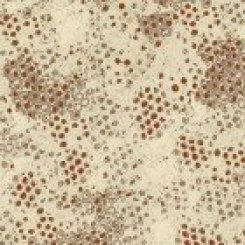 Nov. 3 @ 6:00 pm- Strip Stars: Use strip piecing and many other time saving techniques to simplify complicated looking designs. 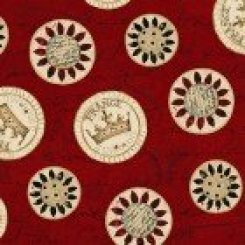 Make a runner or a quilt. Angles With Ease 2 and triangle ruler required. Nov. 7 @ 10:00 am- Mega Bow Tucks: This is the third and last in our series of the ever popular Bow Tucks Tote patterns. Yes! This is our largest bag ever! 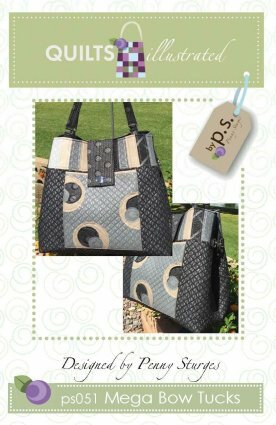 It is on the sleek stylish side the large tote sprectrum. Mega (it’s nickname) has swivel hook hardware at each side to give it a smaller silhouette toward the top. Mega has pockets lining the entire inside. 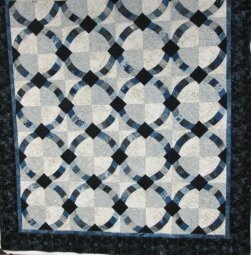 Nov. 14 @ 10:00 am- Metro Hoops: This quilt looks hard but with the ruler and a few instructions, you will have it put together in a breeze. *Ruler & pattern required. 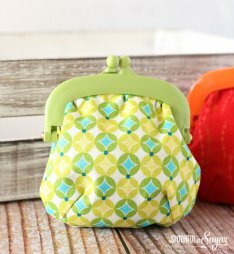 Nov. 17 @ 6:00 pm- Jelly Clip Bag: The frames come with a pattern to make a sweet little purse which features a slightly gathered top and a roomy interior. Nov 20 @ 6:00 pm- All Nighter: Work on anything that you have in your stash or come get something new. A great time to get together with other women and enjoy sewing and friends. Sew as long as you want! We will stay until you decide to leave. Dec. 5 @ 9:00 am- "Cora" The Common Owl: You are able to choose your pattern from Fiberworks and be prepared for a fun lesson on cutting and designing. Dec. 18 @ 6:00 pm- All Nighter: Work on anything that you have in your stash or come get something new. A great time to get together with other women and enjoy sewing and friends. Sew as long as you want! We will stay until you decide to leave. Who came first, the ROOSTER or the egg? 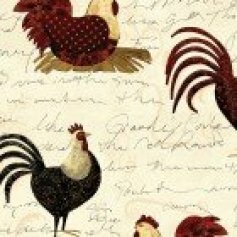 New Rooster Fabric in and it will sure tickle your fancy! 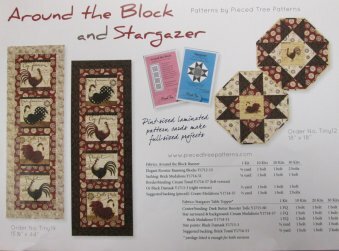 We are in the process of making these projects out of the Elegant Rooster Fabric. Create a modern piece of art with these easy to applique oversized flowers. 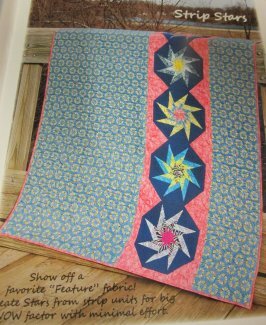 Fantasy Blossoms, perfect for the confident beginner, comes in a full color pattern with reversed templates for fusible applique. We carry the fabric line of Soul Blossoms. 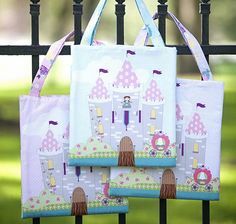 We have this darling Pack and Play Panel with instructions included to make this cute bag for a little girl! The front cover of this book just does not do this justice. 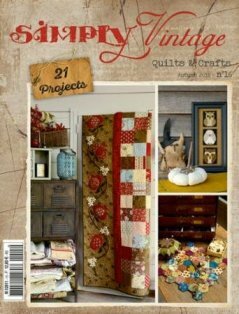 The book is filled with all sorts of projects that are vintage and sure to please that "love of old" side of each of us.